Oh, the woes of hair care! If you are anything like me, you have good hair days and bad hair days. It’s part of the human condition. If only it wasn’t so complicated! Personally, I don’t do much more than wash and dry my hair. I’m not one to style it or use hair products to make it do one thing or another. Yet, even with a really simple routine of just washing, it’s tricky to get my hair to do what I want it to do – not be oily. Almost three years ago I really started going “green.” I was revamping my real food focus and also started paying attention to the ingredients in the household and body products I was using. Most of the shampoos and soaps on the shelf are full of chemicals. They may make your hair sparkle and shine, but what is the long term effect of those chemicals on our bodies? Our skin is our largest organ, and it will absorb what we put on it. There are many toxins that we can’t control, so it’s important to limit the ones we can..
One of the easiest first steps to take in terms of healthier non-food items is to start changing the types of body products you use. Shampoo is something that almost everyone uses! We all need some way to clean our hair, especially if you are prone to greasy hair like me. Over the past couple of years, I have tried many different methods of keeping the oil slick on my head at bay. The first non-commercial attempt was no ‘poo. I tried that for a while and liked what it did for my hair. After some time though, my hair started to get a little too dry, even with an apple cider vinegar rinse. I was feeling a little lazy about creating something else that might work so I decided to just use the Castile soap that I make. I really liked how that was for my hair. It would actually stay clean! When I became pregnant last year, my hair went nuts, so I went back to commercial shampoo for a little bit. I tried to make sure they were free of the harsh toxins, but those tend to cost quite a bit more and my budget wouldn’t be able to handle the price tag for long. To save myself from breaking the bank with expensive “chemical free” shampoos, I tried mixing my own liquid shampoo. This made my hair super silky, but after some time, it made my hair too greasy. I have naturally oily hair and the mix just didn’t work out for me. However, this blend would be really great for someone with dry or coarse hair. I ended up going back to using handmade soap. This time, though, I’m using a recipe that is better suited for hair care. There are certain oils and herbs that will nourish and tend to your hair much better than others and I’ve formulated a mix that so far is working great! I’m utilizing the nourishing effects of aloe vera oil, jojoba oil, and castor oil. These oils are excellent for keeping your hair silky and soft with enough moisture to keep it from drying out. Herbs such as rosemary, sage, nettles, and arnica are really good for hair growth and strength. **Note: I know there are a lot of essential oil companies out there and I’ve certainly tried my fair share of brands. But after testing and researching and more testing, only one is worth spending money on (in my opinion). For a couple years now I’ve been committed to Young Living oils, and you can read more about their oils and my decision HERE. Note: Lye is a caustic substance and needs to be handled carefully. Wear protective eye wear and long sleeves and gloves. Always make sure to pour the lye in to the water and not the other way around. It could cause a small explosion! As long as you are careful with handling it you shouldn’t have any problems. This part of soap making is definitely something to do while the kids are otherwise occupied. To start out, plan ahead by a couple of hours because you need to infuse your water with herbs. Heat your water just to boiling and pour into a glass jar. Add in your choice of herbs and screw on the lid. Let rest for at least two hours so the water will pull out the nutrients and scent from the herbs. Once the water is infused, re-measure it into a large heat proof bowl and add more water if necessary. Note: It is very important to have accurate measurements in soap making. Inaccuracy could cause your shampoo to be too caustic and burn the skin. Wearing gloves and eye protection, measure your lye into a separate dish. Take your water and lye outdoors to mix; they throw off some strong fumes! Add your lye into the water stirring as you pour. Note: Always add the lye to the water and not the water to the lye. That could cause a very bad reaction! You will see the herbal infused water change colors as you mix. I find the color change very fascinating! 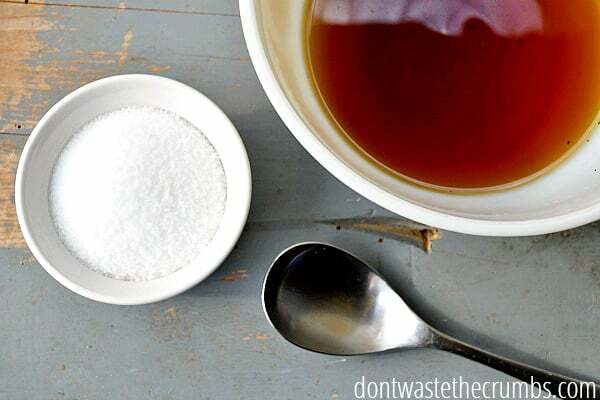 Leave the lye mixture outside to cool slightly while you start on the next step. As you go back inside, place the dish that contained the lye into the sink and fill with soap and water and let it soak. You will want to make sure and wash it wearing your gloves. Measure your oils (minus the essential oil if using) into a crock pot and heat on low. Again, be sure to get accurate measurements to ensure proper neutralization through the saponification process. This step may take a while depending on the temperature of your home. 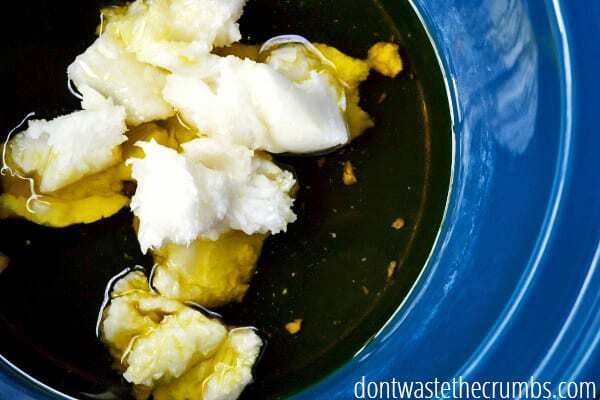 Soap making is much quicker in summer when the coconut oil is already soft, but you can easily step away for a minute if you need to while the oils melt. Once the oils are melted, it’s time to add in the water/lye mixture. Wearing your gloves and eye protection again, stir the water/lye into the oils. Place your large bowl in the sink with the other lye dishes to wash when you are done. Now comes some fun! You need to mix the oils and water/lye mixture to “trace.” This is where the shampoo starts to saponify (making the soap into soap!). The best way to mix it to trace is to use an immersion blender, otherwise you will be stirring by hand for quite some time. 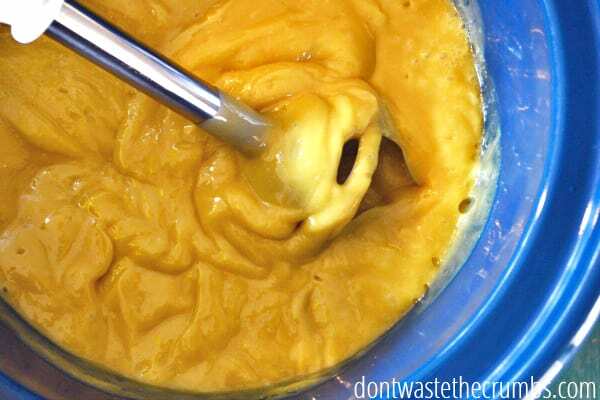 However, you CAN use either method, and you should stir or blend until the shampoo looks like pudding. Stir in the coconut milk. 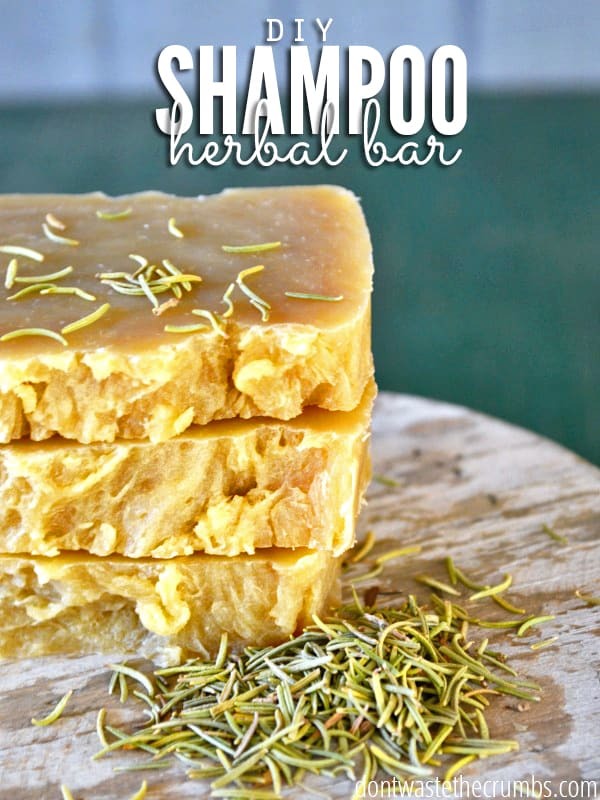 This adds a really nice texture to the shampoo bars and nourishes the scalp. Cover the crock pot and let cook for about an hour for the shampoo to cook and reach neutrality. If you let it go a little longer, it’s okay. You can use a pH testing strip to make sure it’s at a pH between 6 and 8 if you’re concerned about the caustic ingredients. I typically don’t and haven’t had any issues. If you are using essential oils for scent and hair benefits, add them in after your shampoo has cooked to neutrality. How much you add will depend on your scent preference and the strength of the oil. Keep in mind that it will smell very strong at this point, but once the soap cools the scent will dissipate some. I tend to go on the heavier side so I get a good strong scent. Now it’s time to put your shampoo into a mold! I use a loaf mold. You can easily use a loaf pan, mini-loaf pan, rectangle box, or even a large shallow baking dish (you will cut it differently for this shape mold). Line your mold with parchment paper or plastic wrap and scoop in your shampoo. It will be hot, so be careful. For an extra touch of pretty, sprinkle dried herbs on top. 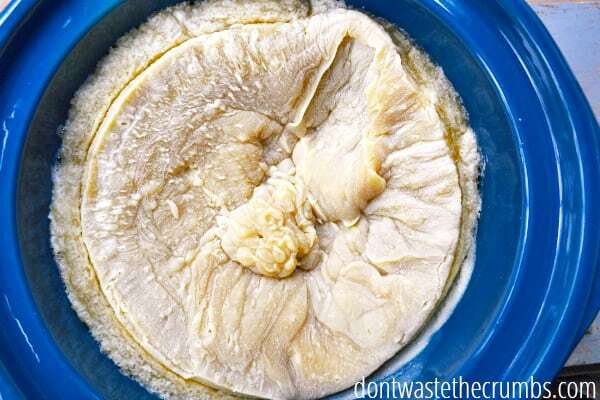 Gently wrap the mold in a towel and place in a cardboard box or warm cabinet. If it cools too quickly it may split on the top. Let it set for 24 hours. Once it has set, gently remove from the mold. Cut your shampoo into your desired size bar, but approximately one inch thick is my goal. Using the hot-process method, the bar is at neutrality by this point so you can go ahead and use it now. For the rest of the bars, place in a cardboard box with some space in between each for some air flow. The bars will continue to harden as time goes on. Because this recipe uses a lot of coconut and olive oil it will turn out fairly soft. You should store unused bars in a cool place. If you cut your bars into about 4 oz bars you end up with each bar costing $2.50. A bar can easily last three weeks or so. That’s less than $5 a month for shampoo! That works for me considering one bottle of chemical free shampoo can run upwards of $8-$9 per bottle! I have used several different recipes of Castile soap in my hair, but have found that this mixture is really nourishing to my hair. I always follow it up with a 1:3 mix of apple cider vinegar to water as a conditioner. Spray it on right before jumping out of the shower (and don’t rinse) to soften hair and give it some shine. The vinegar scent dissipates quickly. This is becoming my favorite hair washing method. It is easy to use and works really well with my oily hair. And since I’m avoiding the chemicals found in commercial shampoos, it’s a win-win situation! Do you use an all-natural shampoo? Have you ever tried a shampoo bar before? Wow! This is fantastic, Heather! I’ve tried “no poo,” but it wreaked havoc on my oily hair and skin. I’ve recently been buying “cleaner” shampoos, but am still not 100% confident they’re free of questionable ingredients. I’m pinning this recipe to try once we’re through the holiday hub bub. Hey Dena! I rub the bar straight into my hair. It gives me the best suds to wash with! Hi Heather, great recipe! Do I need to rinse with a vinegar rinse? I really like this idea, but I’m feeling tentative about spending the money up front to buy these ingredients when it is possible I might end up not liking the final product. Is there a way to purchase a bar from you? Or do you know of a similar product I could try from the store? Heather, I just checked out your etsy shop! Can any of your soaps be used as shampoo? I didn’t see any marked specifically as shampoo bars. fantastic recipe! I often used the shampoo bars from the cosmetics store “lush” but if I can make my own- so much cheaper and customizable. I do have a question though- do you use separate tools for soap making and for cooking? Especially the immersion blender, it makes me a little concerned since that didn’t reach neutrality with the recipe. If you do – how do you clean and neutralize your tools? Hi Lauren! I do use separate tools for soapmaking and cooking. I was able to find an inexpensive crock pot at a thrift store. You may be able to find a used immersion blender as well. (I haven’t looked for one since I already had one.) When I’m done with all my soapmaking I wash it all in soap and water and make sure to rinse really well. I haven’t had any issues doing that. Some suggest using vinegar to neutralize everything, but I haven’t found this necessary. Actually you don’t need to wait 4 weeks for the bars to reach neutrality. All soaps(including aged soaps) have a slightly higher PH then neutral(7) the soaps PH settles after about 24-48 hours depending on the recipe. The suggested 4 week waiting period is for the residual water in the bar to evaporate which creates a longer lasting bar. This is true for both hot process and cold process soap. I have tried making soap in the past but haven’t been able to get it to trace. I believe I have some lye left over so I would love to give this a try! Thanks for the recipe! You may need to check your measurements. Soap is picky! If you are doing cold process soap it may be temperature too. Good luck! Is this safe to use on color-treated hair? When you infused the herbs, do you strain them and just measure the liquid? Hi Brenda! Yes, strain the herbs out and just measure the liquid by weight. Thanks for asking! i am all about going natural and i hate the way store bought shampoos make my hair feel; they leave residues and oils. i would love to try this but i’m uneasy because the recipe calls for so much oil, how does it not make your hair greasy? Hey Morgan! 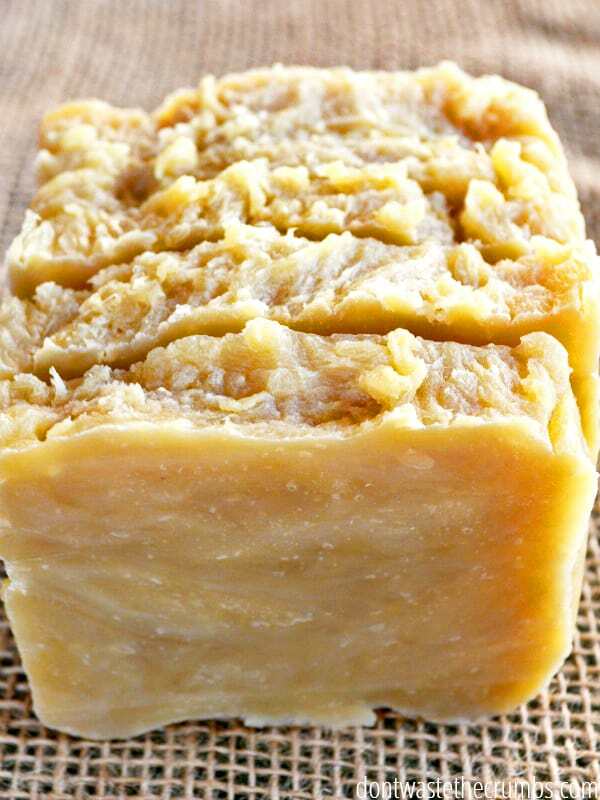 During the soap making process the oils soponify and turn into soap as they react with the lye. There is actually very little oil left in the soap and it won’t make your hair greasy. The small amount that is left nourishes your hair. My hair is very greasy and this recipe leaves it soft and shiny with no residue! I just made my first batch of shampoo bars. Thanks for the recipe! I can’t wait to try them. Hi there ☺ I tried your recipe and love it thank you for sharing. Just wanted to know what to do if pH is too low or too high? It hasn’t happened this time but I just would like to know how to react to it. 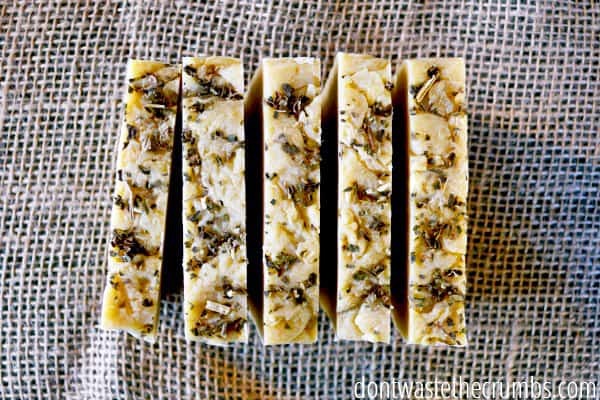 Also do you have a moisturizing hot pressed soap recipe for the body? Thank you for your reply. Question, are you using aloe vera gel, or an infused oil? If you are using gel, are you adding it to the oils and cooking it? Hi! Thank you for sharing this great recipe. How do you turn this soap bar into an actual liquid shampoo? We have gotten used to using a liquid shampoo in our house and I would love to use this as a liquid recipe just don’t know how. Thank you again!!! 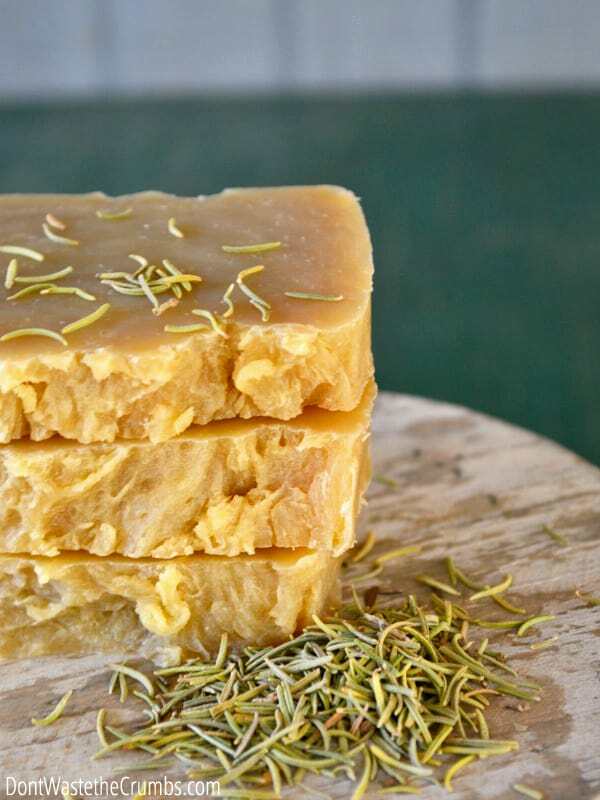 Are you using the shampoo bar with hard or soft water? I would like to use a shampoo bar, but they don’t react well with our hard water. I’m pretty sure our water in CA and now in GA is hard water. Hi I found this site with this wonderful recipe. It seems really easy, but there is one little thing I can’t find. When you make the cold version, do you just mix everything? No heating at all? I would also like to know about the aloe vera oil. Am having a hard time finding in but gel can be found in abundance. Is the oil just the gel mixed with a carrier oil? Hi Harmony! We used aloe vera oil in this recipe, not the gel. I’ve linked to the product in the recipe, so if you can’t find it locally, that may be the best option! Wanted to make sure. Will keep searching for the oil. The one you linked to on Amazon unfortunately doesn’t ship to Australia but I’m sure there will be others. Can I ask how to make the herbal soak? Soak your herbs in hot water like you would make tea. 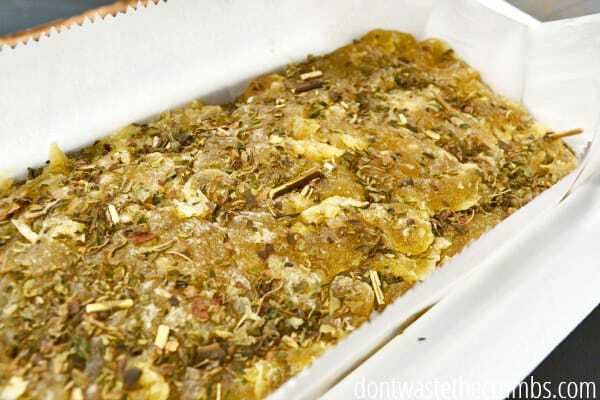 Strain out the herbs and use the herbal water as stated in the recipe. This is exactly what I’ve been looking for! Thanks! I am so going to make this! Love your blog and would love to share my new blog, if I may : therhodeislandmom.com because I am just entering the blogging world! Hi. I was curious what is the superfat % for this recipe? what substitutes would you recommend for the coconut milk ? Lisa, you can substitute water for the coconut milk. is it coconut milk from a can or a carton like the one you drink? Hi, I really want to try this recipe but I don’t have a crock-pot and I can’t find a cheap one, would I be okay to substitute an ordinary pot instead? Total newbie question here. When the measurements say oz is that weight? or volume? I thought it would be weight, but was just confused because it said the scale was optional, but then how would you measure out weight without a scale? This would be weight, but you can skirt around it. 1 oz = 2 Tbsp. It won’t be “exact,” but it should be close enough! I was thinking of switching out lye for glycerin. How much glycerin do you think I’d need for the 4.4 oz of lye? This might be too personal of a question, but how often you wash your hair? You mention that a bar of soap lasts about 3 weeks. If you wash your hair more often, the cost goes up and if you wash less often, the cost goes down. Thanks for the help! Not at all Meghan! I wash my hair every day. I hope that helps! Thanks for sharing! I love how you made the top pretty! I didn’t know how to do that. I’m having difficulty finding aloe vera oil. Can I substitute a larger amount of one of the other oils? do you think it would be ok to use refined coconut oil instead? Hi! I have 2 questions. When you say aloe vera oil, is that an infused oil? I found some that said it was made from the flowers and others had a carrier oil and others didn’t say. I’ve been using this bar for almost a week. Does your hair lose the waxy/slightly greasy feel after more time or did I do something wrong? Can I cook the soap without the 3.5oz coconut milk and add it stirring very well when the soap is finished cooking? So it can stay fluid when I mold it? I can’t find aloe vera oil in my area, is there any other oil I can substitute for this? I used the aloe juice that you can find at some pharmacies and mixed it with coconut oil (1:1). That seems to work well. When my current bottle of shampoo is gone I’m going for the shampoo bar method! I’m not a fan of working with lye myself so I looked on Pinterest (of course) several different bloggers recommended an organic melt and pour base that has coconut oil and goat milk in it- then you can customize your bar yourself. I’m also trying some of the Bend Soap & Lotion- we have sensitive skin over here too! I have aquagenic puritis (allergic to water in a very weird way- worse in the hotter months) and an all natural sponge and soap seem to help somewhat. Thanks for all the suggestions and tips and motivation to be healthier inside and out! You’re very welcome Kristi! I hope you like Bend Soap – we STILL love their bars and keep plenty on hand!